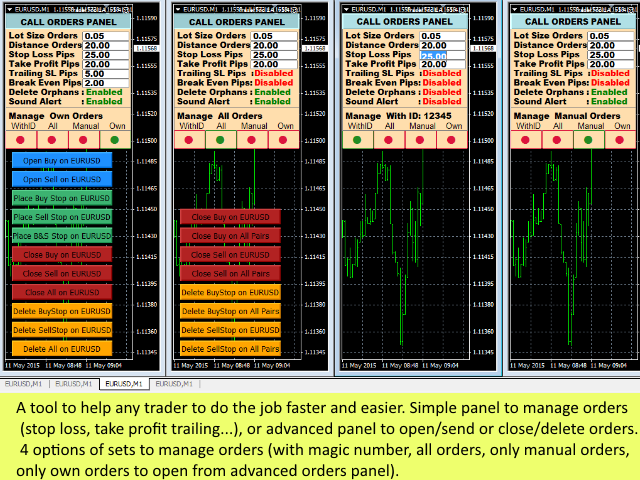 TraderTool is a tool/panel that will help any trader to perform trades quickly and easily. The product has been developed with user friendliness and ease of use in mind. It has the ability to manage multiple types of orders, either placed by an Expert Advisor, or manually. It also allows you to place orders in a single click. You can add stop loss and take profit, initiate a trailing stop or start break even operation, and all these with the simple panel. 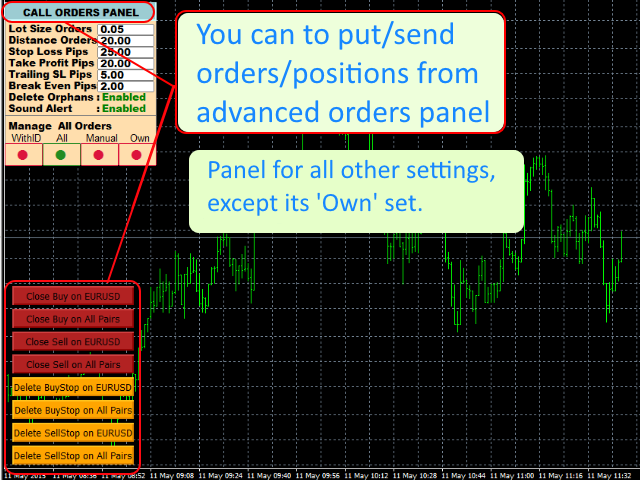 With the advanced panel (you can call it from 'CALL ORDERS PANEL'), you have the opportunity to open/send and close/delete orders. All settings of the distances, stop loss, take profit, trailing stop, break even and the lot size can be done through the chart. There is an option to make a grid of pending orders. To do this, press the button for pending orders more than once. The number of button presses indicates the number of pending orders to be placed. It is useful and necessary for all traders with little or extensive experience in transactions. 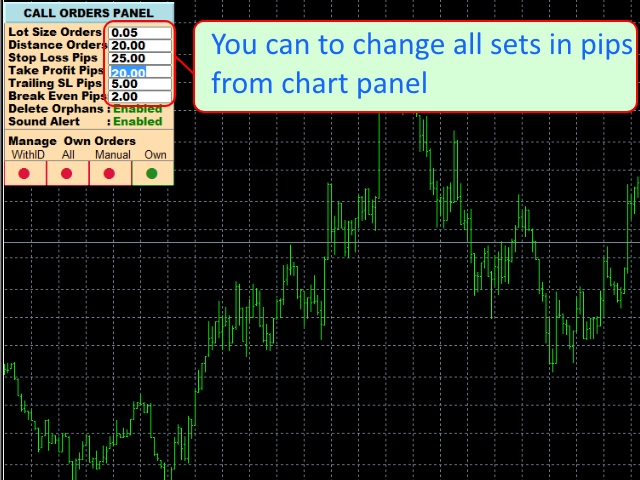 You can use it on multiple charts with different settings simultaneously. It is suitable both for those trading manually and for those using an Expert Advisor and willing to have full control over stops and profits. DistanceOrders - distance for pending orders. DeleteOrphans - if one of the pending orders (buy stop or sell stop) is triggered, the tool deletes the opposite one (regardless of whether only one buy stop and one sell stop are present or it is a grid of pending orders). PutStopLoss - add a stop loss to an order. 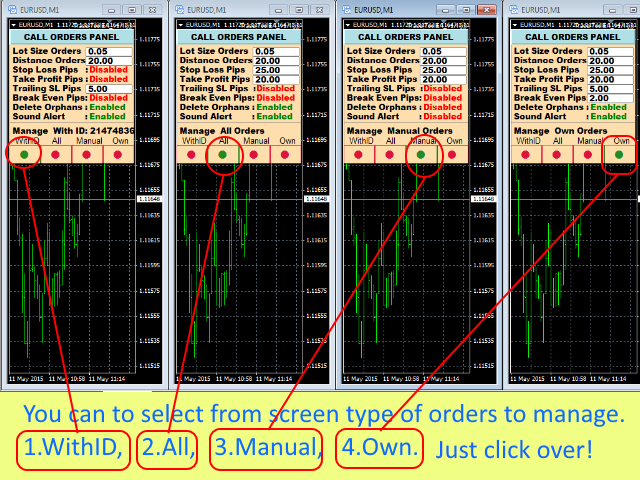 StopLossPips - stop loss pips. PutTakeProfit - add a take profit to an order. TakeProfitPips - take profit pips. UseTrailingStop - use trailing stop loss. UseBreakEven - use break even. BreakEvenAfter - profit in pips before starting break even. BreakEvenPips - break even in pips. DeleteTakeProfit - delete a take profit (if an order without a take profit is needed, or a new one is added). DeleteStopLoss - delete a stop loss (if an order without a stop loss is needed, or a new one is added). MagicNumber - magic number (orders' ID) to manage orders with this magic number. SoundAlert - sound for any operation. 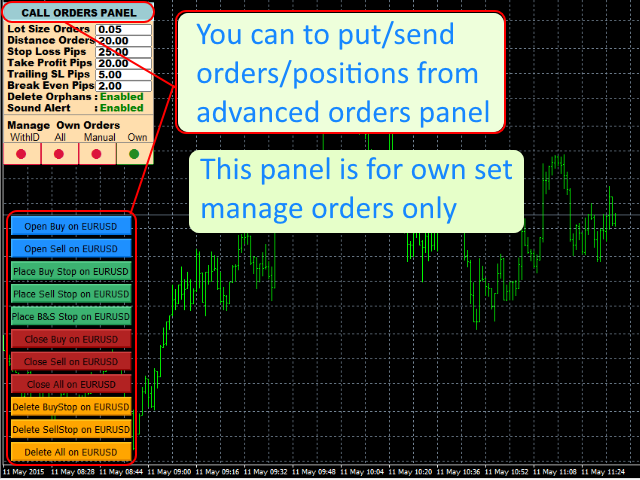 New option to make grids of pending orders. Option to count risk management automaticaly (lot size).